As medicine strives for higher efficiency and productivity, the number of experienced senior faculty members available to train the next generation of medical professionals continues to decrease. 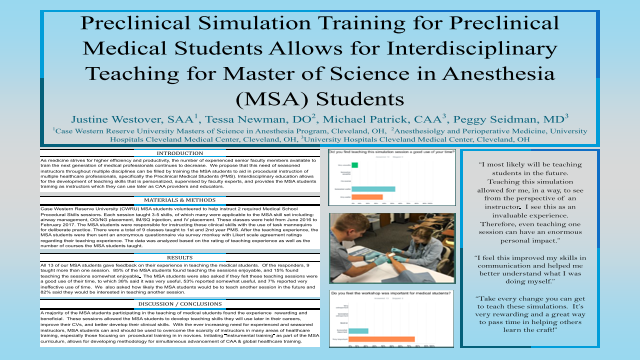 We propose that this need of seasoned instructors throughout multiple disciplines can be filled by training the MSA students to aid in procedural instruction of multiple healthcare professionals, specifically the Preclinical Medical Students (PMS). Interdisciplinary education allows for the development of teaching skills that is personalized, supervised by faculty experts, and provides the MSA students training as instructors which they can use later as CAA providers and educators. Case Western Reserve University (CWRU) MSA students volunteered to help instruct 2 required Medical School Procedural Skills sessions. Each session taught 3-5 skills, of which many were applicable to the MSA skill set including: airway management, OG/NG placement, IM/SQ injection, and IV placement. These classes were held from June 2016 to February 2017. The MSA students were responsible for instructing these clinical skills with the use of task mannequins for deliberate practice. There were a total of 9 classes taught to 1st and 2nd year PMS. After the teaching experience, the MSA students were then sent an anonymous questionnaire via survey monkey with Likert scale agreement ratings regarding their teaching experience. The data was analyzed based on the rating of teaching experience as well as the number of courses the MSA students taught. All 13 of our MSA students gave feedback on their experience in teaching the medical students. Of the responders, 9 taught more than one session. 85% of the MSA students found teaching the sessions enjoyable, and 15% found teaching the sessions somewhat enjoyable. The MSA students were also asked if they felt these teaching sessions were a good use of their time, to which 38% said it was very useful, 53% reported somewhat useful, and 7% reported very ineffective use of time. We also asked how likely the MSA students would be to teach another session in the future and 82% said they would be interested in teaching another session. A majority of the MSA students participating in the teaching of medical students found the experience rewarding and beneficial. These sessions allowed the MSA students to develop teaching skills they will use later in their careers, improve their CVs, and better develop their clinical skills. With the ever increasing need for experienced and seasoned instructors, MSA students can and should be used to overcome the scarcity of instructors in many areas of healthcare training, especially those focusing on procedural training in in novices. Initiating “instrumental training” as part of the MSA curriculum, allows for developing methodology for simultaneous advancement of CAA & global healthcare training.